Finding cancer as early as possible is critical to saving lives. Mayo Clinic is creating a new era in health care with tests that make early and accurate detection of common cancers easy. Many are minimally invasive, convenient, cost-effective and widely available, removing the barriers that prevent people from getting treatment. 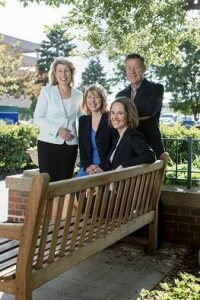 Deborah J. Rhodes, M.D., Carrie B. Hruska, Ph.D., Katie N. Hunt, M.D., and Michael K. O’Connor, Ph.D.
Mammography may not be enough to spot breast cancer for about half of all women who are screened. These women have dense breast tissue. 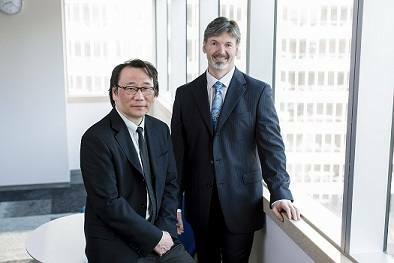 They can be helped by a breast imaging technique pioneered at Mayo Clinic that nearly quadruples detection rates of invasive breast cancers in dense breast tissue. On a mammogram, both dense tissue and tumors appear white. Spotting a tumor in dense tissue is like looking through a frosted glass window. Molecular breast imaging, or MBI, provides a clearer picture. “MBI can uncover the reservoir of cancers that remain undetected on screening mammography because of masking by dense breast tissue,” says Deborah J. Rhodes, M.D., a Mayo Clinic Breast Clinic physician and a member of the team that developed the supplemental test. In MBI, a short-lived radioactive tracer is injected into the vein. If tumor cells are present, they absorb the tracer like a sponge and illuminate on the image. A Mayo Clinic team of physicists, radiologists and internists has spent nearly 15 years developing and evaluating MBI, including three clinical trials with over 5,000 women. Eugene D. Kwon, M.D., and Val J. Lowe, M.D. Recurrent prostate cancer lights up Prostate cancer is the most common cancer among men, and about 30 percent of those diagnosed will experience a recurrence. These recurrences can often be difficult for physicians to find. A Mayo Clinic research team developed an imaging method known as Choline C-11 positron emission tomography, or PET, scan that can find recurrent prostate cancer earlier than other tests. “It’s a way of looking at the body three-dimensionally so you can see through the body and around the body to find cancer,” says Mayo Clinic radiologist Val J. Lowe, M.D., who helped create the new technology. Choline C-11 uses a radioactive form of the vitamin choline, which is readily absorbed by cancer cells. The drug is injected into the patient who then has a PET scan. In about one-third of men, Choline C-11 PET scanning picks up metastatic lesions that aren’t seen with traditional imaging. Sciences Corp. to develop the test. Colorectal cancer is the second-leading cancer killer in the U.S. Yet many people who should get screened skip it. Colonoscopy, the most widely used screening method, is expensive and requires bowel prep, sedation and time off work. Mayo Clinic researchers co-developed a test, now called Cologuard, that screens for colorectal cancer by measuring tumor DNA in stool. Cologuard is mailed to patients at home and requires only a stool sample, with no bowel preparation, medication or dietary restrictions. A patient mails the sample to a lab for analysis, and results are sent to the prescribing physician. In published studies from the screening setting, this noninvasive, inexpensive test detected 94-100 percent of early, curable-stage colorectal cancers. Mayo Clinic became the first health care organization to offer Cologuard. 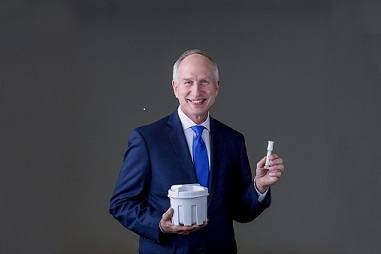 Mayo Clinic gastroenterologist David A. Ahlquist, M.D., and his research team collaborated with Exact Sciences Corp. to develop Cologuard. Among the first 100,000 patients to send in tests, 42 percent had never been screened for colorectal cancer by any approach. “That’s exactly what we were hoping for — improving screening participation rates should lead to more effective cancer detection at the population level,” Dr. Ahlquist says. 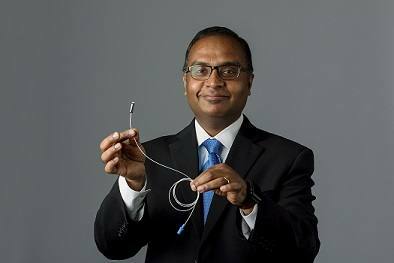 Over four decades, esophageal cancer cases have increased 600 percent in the U.S.
“Compared with all other, more common cancers, incidence of esophageal cancer has skyrocketed,” says Mayo Clinic gastroenterologist Prasad G. Iyer, M.D. The cancer can be very deadly. A sedated endoscopy at a gastroenterology lab is the recommended screening test today. Dr. Iyer is collaborating with Exact Sciences Corp. and Mayo Clinic gastroenterologist David A. Ahlquist, M.D., to develop a new screening test that scans for DNA biomarkers of precancerous conditions in the esophagus. The biomarkers are picked up on a capsule sponge that a patient swallows. When the gelatin shell of the capsule dissolves, the released sponge is pulled out, providing cellular samples of the esophagus lining. The sample can be gathered in a primary care office without the expense and side effects of an endoscopy, Dr. Iyer says. It’s sent to a lab for biomarker analysis. Early data from studies show very high rates of sensitivity and specificity for predicting the presence of Barrett’s esophagus, a precursor for cancer. The capsule sponge was swallowed by over 90 percent of participants and was safe and well-tolerated. A phase II clinical trial is underway now at Mayo Clinic. When esophageal cancer is caught early, survival is 80–90 percent. “That tells the story of why early detection is the best. That’s the whole rationale for early screening,” Dr. Iyer says. 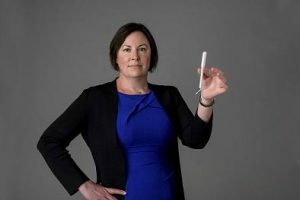 Soon, women may be using tampons to screen for the most common gynecologic cancer in the U.S.
An increasing number of women are diagnosed each year with endometrial cancer. Mayo Clinic gynecologic oncologist and surgeon Jamie N. Bakkum-Gamez, M.D., is attempting to change that trend. In a 2015 study, Dr. Bakkum-Gamez showed it is possible to detect endometrial cancer using tumor DNA picked up by ordinary tampons. Now her team is working to develop the first early-detection test for endometrial cancer using tampons. This would be a prescribed, self-administered mail-in test, similar to Cologuard. “We’re keeping the patient at the center of this. We want to make sure this is a test that provides wide access to care,” Dr. Bakkum-Gamez says. Her team is working on a commercially available test. This story originally appeared in the 2017 print edition of Forefront magazine. Is the tampon type test working with Exact labs or someone else? Breast cancer is a serious disease for women. Blood sample have been used for cancer detection, in what is called ‘liquid biopsies’ (compared to normal biopsy in which a sample tissue is removed from the body and is more invasive).